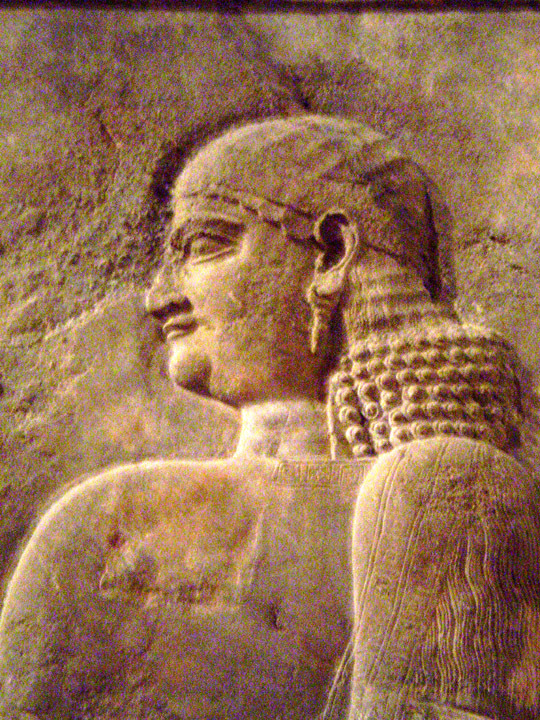 The University of Chicago’s Oriental Institute Museum has a great, concise collection of Mesopotamian, Egyptian, Anatolian and Persian art. The central feature of the first gallery is the The Khorsabad Gate (ca. 721-705 BCE). 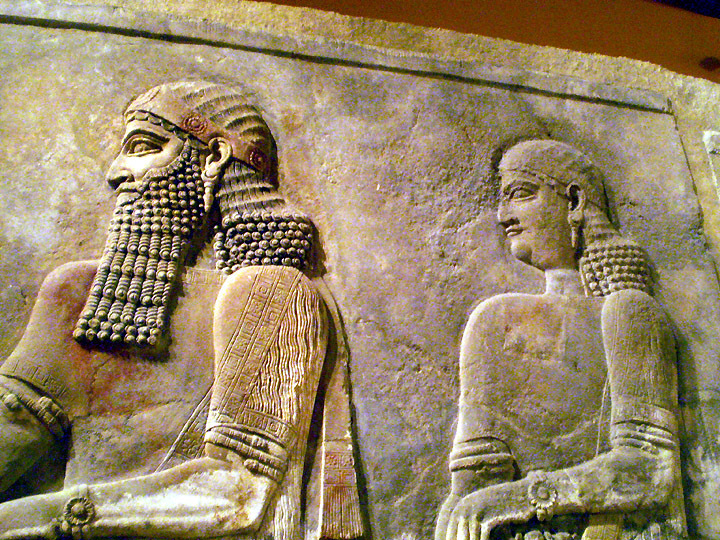 The central bull and procession reliefs would have adored the entrance to the throne room of Assyrian King Sargon II. I’ve already written about some “artistic license” taken in creating the massive human-headed, winged-bull but there is something else peculiar about this scene and it suggests some nasty politics. The procession relief is led by a bearded man followed by 5 clean shaven men. Looking closely though, the second man once had a beard but it had been somewhat crudely chiseled off. I could see the outline of a square beard along this chest. Also the roses from his headband had been obliterated. The poor guy who angered the King. 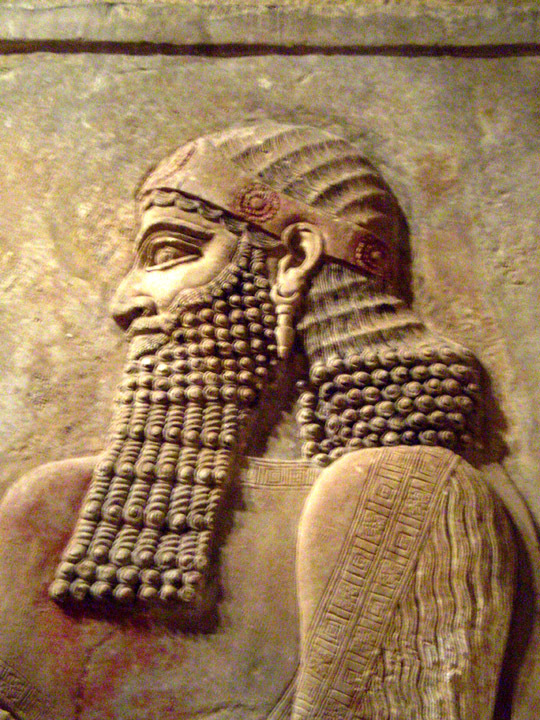 The fist figure is depicted as a proper Assyrian royal man with beard and rose head band. I asked the museum staff (who were very happy that I noticed the obliteration) what this meant. Apparently the king had had two close male relatives, perhaps brothers or sons, which had been shown wearing royal beards and leading a procession of priests. At some point there was a betrayal or a power grab and the second man was completely removed from all records (and presumably also from his position). The beard and headband were changed to turn the figure in this procession into another priest. Front figures from The Khorsabad Gate procession. The transformation was not quite complete. Even if the alterations were not visible, the second man is posed in such as way to suggest a more esteemed figure and still has a rose bracelet. Major changes to the piece would have been too disruptive, but a contemporary viewer would have understood the point of removing the man’s beard. If image is everything, the point has been made very clearly in this altered procession! Awesome post and terrific photos. Thanks Lesley! Your photos are wonderful! The art of the Ancient Near East is something I saddly don’t know enough about. It’s great to see shows like that one in Toronto and the Oriental Institute presenting this period so well.